Riverine fisherfolk, arguably the oldest among traders, are being sold down the river. An unholy synergy of poisoned rivers, government apathy and commercial interests has scripted the epitaph of the original stewards of the river. Ironically, their disappearance has coincided with the country's booming inland fish production, spawned by aquaculture. As the government basks in the glory of the blue revolution, it has chosen to forget their existence - they don't figure in the census nor in any welfare programmes. India's rivers today stink with the death of a tradition that sustained many civilisations. Kagjitola Bhagalpur Bihar. The struggle of 500 families on the banks of the Ganga is to the country's fisherfolk what the Chipko movement was to the forest people of India. In early 1980sit fought a successful battle against landlords and forced the state government to allow traditionalfisherfolk to fish in all the rivers of the state. Now Kagjitola's fishercommunity is on the verge of extinction. Industrial effluents have turned the river into a sewer and embankments have affected fish yield. The fish mafia has taken control over those areas where fish is still available. "We will be killed if we enter the riversays Dasrath Sahni, a resident. Many are migrating in search of odd jobs for survival. Hajo Koiborto Tola, Assam. India's oldest fishing community, Koiborto, (mentioned in the Ramayan) is being forced to abandon its traditional livelihood source. The government has leased the fisheries to the rich contractors. The people watch helplessly as migrants from Bihar and Bangladesh backed by political groups and moneyed contractors catch fish from rivers. Downstream of Hirakud, Orissa. The fishing skills of Jharias, a colourful traditional fishing community, are legendary. But it is of no use now. With dwindling fish catch due to industrial pollution, they have acquired a new identity: 'the gold diggers of Mahanadi'. They scavenge the sands of the river for gold dust.The gold dust will ensure a few days of survivalsays a Jharia membe. Traditional riverine fisherfolk are the new endangered species. Whether it is the Koibortos or the Jharias, it is the same impoverished story of extinction on the riverbanks. There is data on fish species and its production but nothing on the population of riverine fisherfolk. An integral part of civilisations and arguably the oldest trading community, traditional riverine fisherfolk are today a forgotten lot in India. But there is a catch. * Population includes inland and coastal fisherfolkThe disappearance of India's traditional fisherfolk is riddled with a strange irony: India's inland fish yield went up by eight times in the last four decades. It now contributes more than 40 per cent of the country's total fish production and 1.4 per cent of the gross domestic product (GDP). In the Ninth Plan, the Union government allocated around Rs 207 million - 400 times more than its allocation in the First Plan. During 1998-99, 46.3 per cent of the fish catch in the country was from the inland fisheries. In the same period, inland fish production witnessed an annual growth of 10 per cent (marine fish production was only 5 per cent). With an annual fish production of 2.8 million tonnes, India stands second in inland fish production, next only to China. But these wonderful figures mean nothing to traditional riverine fisherfolk: over 78 per cent of inland fish production comes from aquaculture - intensive fish farming from reservoirs and other waterbodies. India's big 'blue revolution' has failed to touch the lives of riverine fisherfolk, the trade's original masters. There is a dedicated department or ministry in every state to look after fisheries development, but none for the welfare of fisherfolk. Even the census of India refuses to acknowledge them as a separate community - it doesn't have clear classification of the riverine fisherfolk. Neither do they exist in the livestock census. Deciphering the number of riverine fisherfolk is left to the guesswork of the researcher. Marine fisherfolk are, however, classified as coastal or deep sea fishers. With rivers dying due to pollution and dams and embankments altering the flow, fisherfolk are being fast pushed into oblivion. Though no official figures are available for the riverine fisherfolk, their population is estimated to be around 0.45 million. This also includes the coastal fisherfolk. A large chunk of the 387 communities of fisherfolk, which the Anthropological Survey of India has identified, is involved in inland fishing. These people are dependent on the 191,024 kilometres (km) of rivers and canals and the numerous wetlands and reservoirs. Kagjitola is a symbol of the riverine fisherfolk's plight. It is unimaginable. A huge river like the Ganga failed to sustain even 500 fishing households. Several boats that lie on the outskirts of the village showcase what Kagjitola and its inhabitants have become - out of job, abandoned and neglected.We fisherfolk are cursedsays Dasrath Sahni, a resident. Till the 1980s, two feudal families claimed fishing rights over an 80-km stretch of the river from Sultanganj to Pirpaiti. Dasrath and his fellow fisherfolk had no choice but to work under this oppressive regime. Inspired by Jaiprakash Narayan's Total Revolution, they launched a movement in 1982. After a decade-long struggle, they managed to free themselves from the clutches of the feudal lords - the Bihar government made all the rivers free for fishing. But that has not made much difference. The fish mafia has now replaced feudal lords (see box:We will fight..."). Though an unorganised sectorfishing in Bihar provided sustenance to thousands of people - government figures vary from 80to 1100In the 1960sthe Kosi belt of north Bihar produced 52 per cent of the spawns of the country. In times of faminefish used to be distributed to the affected people. Nowthere is a famine of fish. There is nothing to catch. In Biharthe government has issued identity cards to the traditional fisherfolk. But this card imposes some weird restrictions. For examplethe fisherfolk of Kagjitola can fish only in a particular area. This area isin factthe river bank. The riverit seems is reserved for the contractors or the fish mafia. Take the case of the Koibortosnot very far away from Bihar. The community (numbering around 40has been fishing in the nearby Sesa Noi and Hajikoti rivers since early 19th century. "It all changed when money came into thissectorsays Nageswar Medhi, a resident of Koibortos. The government grants lease for fishing to the rich contractors, though they are supposed to be leased to the traditional fisherfolk. The contractors squeeze the fisherfolk.The whole benefit goes to the contractor and the poor fisherfolk get almost nothingrues Horidhan Das, another resident of the village.Fisherfolk from the Kahalgaon area are working as fish labourers in the estuarine areas of the Ganga and the Sunderbanssays Harekrishna Debnath of the Kolkata chapter of the National Fishworkers' Forum (NFF). In some states, non-fishing communities are edging out traditional fisherfolk. The Dheevaras of Kerala are a case in point. This low caste Hindu community was traditionally involved in inland fishing. In the Kuttanad region, they used to be an integral part of inland fishing. According to a study by R V Jose, professor and head, department of economics, Church Mission Society College, Kottayam, non- fishing communities like the Ezhavas have driven out the Dheevaras. In West Bengal, less than 25 per cent of the people involved in fishing are traditional fisherfolk. Way back in the 1930s, the Malo Barman community of the Titash river in the erstwhile east Bengal was rendered jobless when the river degraded.You hardly find traditional fisherfolk involved in fishing in Assam. It is done bypeople from Bangladesh and Biharsays Mrinal Baruah, director of fisheries, Assam government. A study done in the early 1980s by M P Srivastava and J S Dutta Munshi of Bhagalpur University, Bihar, on the spawn fisherfolk of the Kosi river showed that while the average per capita income of a person for catching a certain amount of spawns was Rs 10, the same amount was sold in the markets of Kolkata for Rs 300. Another study by S C Dey and D Kar of Gauhati University in 1989 showed that the per capita income of fisherfolk of the Son lake in the Barak valley ranged from Rs 1.30 to Rs 8.25. Poor food intake makes them susceptible to diseases.Fisher households spend a considerable amount of their income on medical treatmentssays the study. 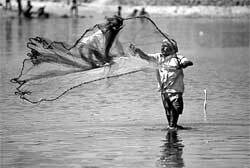 Riverine fisherfolk have not been classified in the caste lists of the governments. Most of the fisherfolk are scheduled castes (SC) and scheduled tribes (ST), depending upon the ethnological characteristics of an area. But there have been squabbles over their status. A classic case was when the Madhya Pradesh government gave ST status to the Majhi tribe only in the Vindhya Pradesh area. In 1976, the benefits were extended to the whole state, but the Mahji sub-castes were still put under the other backward castes (OBC) list. When chief minister Digvijay Singh wanted to grant all Majhis with a ST status, political pressure, caste politics prevented him and now Majhis are again left nowhere. A glance through official documents reveals the priorities of the government: aquaculture is the mantra for fish production in the country. For example, Andhra Pradesh sends cultured fish to 17 states, most of which have very rich river systems.Over 80 per cent of the fish in Andhra goes to states like Orissa and Assamsays K Gopakumar, deputy director general, fisheries, ICAR. Since 78 per cent of the inland fish production comes from aquaculture, the riverine capture fisheries and its fisherfolk don't feature on anybody's agenda.You willfind information about marine fisherfolk but nothingon riverine fisherfolksays Debnath. Every state has its own fisheries department, which is primarily concerned with fish status, not for the welfare of the riverine fisherfolk. Even for fish seed production, traditional fisherfolk are being left in the cold. Between 1973-74 and 1998-99, the fish seed production has increased by 37 times. The per capita availability of fish is now 8.11 kilogramme (kg) per annum. Going by the requirement of 11 kg/annum, the present supply has to be doubled. There is still a huge gap between fish seed production and demand. Fish farmers' development agencies of the governments are gearing up to meet this demand. The World Bank also has moved in for support - it has invested in aquaculture and shrimp farming in many states of India. However, seed from induced breeding sources is preferred over riverine or other natural sources. People with ownership of breeding sources like ponds, or rich contractors who can acquire lease, are in business, edging out the traditional fisherfolk once again. Pollution is one of the biggest killers of inland fish. And traditional fisherfolk are worst affected,says K Gopakumardeputy director-general (fishery)Indian Council of Agricultural Research (ICAR)New Delhi. Data from the Central Inland Capture Fisheries Research Institute (CICFRI)Barrackporeshows that fish catch in most riverine fisheries is declining. The Gangafor examplereceives mostly untreated effluents from 29 cities70towns and thousands of villages. This is showing up in the fish catch. 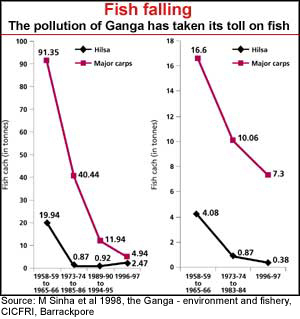 Annual inland fish landing of major carps in Allahabad and Bhagalpur has drastically come down (see graph: fish falling). Moreovermass fish deaths have been reported in Gomtia tributary of Gangaon many occasions. It is the same story for every river in India. The Periyar in Kerala has been severely affected due to pesticidesindustrial waste and sand mining. Dyeing industries have almost killed the Noyyal in Tamil Nadu. "Five species of fish that used to be abundant in Assam's waterbodies are now raresays Ashok Bishaya, a prominent member of the Koiborto fishing community in Guwahati. The Yamuna is nothing but a tiny sewage drain with zero aquatic life as it leaves Delhi, says P V Dehadrai, former director-general (fishery), ICAR, who has done a study on the status of fish and fisherfolk. Villagers of Khunti village downstream of the Hirakud dam on the Mahanadi in Orissa say they catch less than half the amount they used to catch in 1950s and 60s.Fish catch has come down to 20 per cent in the last three decades and earnings are down to less than 50 per centsays Bhagwati Mukhiya, a mallah and resident of Kusheshwersthan. The traditional fisherfolk share an intricate relationship with nature. It is their annadata and they cannot afford to play with itsays Bishaya. Non-fishing communities, however, go for maximum extraction.One of the factors for overfishing is the duration of the leasewhich is one yearsays Dehadrai. The leaseholder wants to extract as much as possible from the river. The problem gets worse with the use of fishing gear. While the traditional fisherfolk's gear captures only a particular size of fish, the rich contractors use massive, but fine mesh nets - most of them made from mosquito nets. For example, the one used in Bihar, Mahajaal, is more more than 50 metres wide and about 750 metres long. It needs at least three boats and 15 people to operate. But just three people are needed to operate the traditional nets. Mahajaals sweep entire stretches of the river without even sparing a fingerling. These are expensive - they cost about Rs 60,000 and only the rich contractors can afford them. They are banned too. And small nets are no match for Mahajaals.We carry our small nets in the bags. We are ashamed to show themsays Bajrangbali Sahni, a resident of Kagjitola. With a dwindling fish population, people have resorted to devious methods to catch fish. In Bihar, rich contractors are known to poison the river at one point and collect the dead fish that is available.About 100 grammes of parmar (aldrin) can kill fish for up to 3 km. It does not even spare the eggs and the living organisms the fish depends onsays Gangaram Sadha of Deoka village, Madhubani. The use of dynamite sticks to blow up a portion of the river is also a common practice in many rivers. Norms are flouted with impunity. There is a ban on fishing up to 3 km downstream of the Farakka barrage in Bihar during monsoon, the breeding period of fish. However, one can see hundreds of boats fishing up to 100 metres of the barrage, says R K Sinha, professor at Patna University.The moneyed section of the fisherfolk are hand in glove with officials and security personneladds Sinha. Developmental projects like dams, barrages, embankments and roads have also contributed to fish loss. Reservoirs created after damming the rivers not only block the routes of migratory fish like Hilsa, which move up from the estuarine areas to spawn, but they also often lead to reduction in fish numbers and species diversity. The damming of the Mahanadi has affected fish diversity - from 183 species in 1955 to just 43 in 1992.The situation is grimsays P K Mishra of Orissa's fisheries department. The Farakka barrage in Bihar that came up in 1975 has made a deep impact on the fish catch.Around 98 per cent of thefishery has collapsed after the barragesays Sinha. Similarly, the construction of the Hirakud dam in Orissa has led to a sharp decline in fish catch - from 293,601 metric tonnes in 1996-97 to 234,632 metric tonnes in 2000-01.We catch just half of what we used to in 1950ssays an old fisherfolk of Khunti village, who has given up the occupation. Moreover, other factors such as water extraction have further worsened the situation. According to V V Sugunan, director, CICFRI, large-scale water abstraction for irrigation and other purposes is responsible for the decline of major carps in the Ganga. Encroachment has also reduced the area of waterbodies and diseases have taken a toll on the fish population in Bihar and Assam. The list of threats is endless. If traditional fisherfolk have to survive against these odds, they need support from ahumanised" system. DESPITE the problems, the solution seems easy. Sample this: "Even if we get half the fish that we used to catch earlier, we can live again," says Dasrath. What Dasrath is hinting at is the restoration of the ecology of the rivers and inland fisheries. According to Dehadrai, the degradation of the inland open water resources has dealt a major blow to the traditional fisherfolk. These resources need to be restored. The polluters must be taken to task. But given India's poor track record of controlling pollution, quick results will be difficult. With states squabbling over water rights, pollution control boards hand in glove with polluters and implementing agencies in cahoots with the fish mafia, it will not be a smooth sailing for traditional fisherfolk. A major hurdle for monitoring inland water resources is the ownership system. The Indian Fisheries Act came about in 1897, and following Independence, a number of inland water resources were transferred to the government institutions for revenue earning purposes. Now with the panchayats, private contractors and other government agencies are the owners and fishery resources are not common property resources. Being an unorganised sector, there is neither data nor regulation. This has again gone against the traditional fisherfolk. To make matters worse, some experts are losing hope on the riverine systems as a potential capture fishery resource. However, they believe that rivers can be used effectively to conserve fish biodiversity. Take the case of Assam. According to Pradeep Sharma, professor of the department of geography, Cotton College, Guwahati, most of the 3,513 wetlands in Assam are not even registered. The fishery development corporation of Assam only has a little more than 200 beels (wetlands) that are under the corporation. The rest is either wasteland or being fished by different people without any regulation. At a seminar on riverine and reservoir fisheries held in May 2001 in Kochi, it was stated that with proper management, the reservoir fisheries of India could yield 50 kilogrammes of fish from a hectare annually, against the 20 kilograms now. Reservoirs need to be a thrust area for development, the recommendations stated. Moreover, along with the two million hectares of reservoirs in the country, there are also 3.2 million hectares of ponds, tanks and other waterbodies. These are conservative government records. "These tanks and ponds were a part of life for the rural people," says Dehadrai. Thako Sadar, a fisher living on the embankments of the Kamla river in Bihar, agrees: "It is only the ponds that are keeping us alive." Therefore, it must be realised that ponds, tanks, reservoirs and other such waterbodies are an integral part of the solution. However, the question is that of ownership. And this is related to legislations. For example, the Madhya Pradesh government has given fishing rights to people displaced by the Tawa dam in the reservoir (see 'Net gain' Down To Earth, Vol 10, No 16). Or, as recommended at the seminar, there should be a uniform policy and a committee comprising members of the various departments should look after matters related to fisheries. Moreover, Dehadrai also suggests that the anachronistic fisheries act should be replaced by pragmatic policies that take into account any change in the fisheries status of the country. He adds that the present policies are formulated in the control and revenue structure. They do not encourage any enterprise. The lease policy is a fine example of this. While the lease periods in India for a fishery can extend up to seven years, most of the places it is less than five years. "This makes the lease holder resort to exploitative fishing than making the resource sustainable," says B Lahon, senior official with the Assam Fisheries Development Corporation. Experts say that it is time to think beyond the dying rivers and concentrate on how the other inland resources can be harnessed. There is also a suggestion that fisherfolk should be trained in other fishing-related lucrative trade like rearing ornamental fish. The country has an export potential of US $30 million, against the current US $0.39 million. "Make local fisherfolk stakeholders," says Sunil K Chaudhary, professor of botany in the T M Bhagalpur University. "Fisherfolk should be consulted before taking any decision on the fisheries, cooperatives should be monitored strictly and the deep areas sensitive in terms of fish population should not be leased out," he adds. Clearly, the fisherfolk cannot tide over the very threat of existence on their own. Experts feel that integrating the knowledge of the fisherfolk in the management of fishery resources will go a long way in improving their status. This will provide employment and also make this sector sustainable. But if the situation is allowed to drift, the Koibortos and the Jharias are sure to go under. The plight of biopesticides can be gauged from the fact that no systematic study has been conducted to evaluate their market. Rough estimates by the New Delhi-based Biotech Association of India indicate that they constitute less than 1 per cent of the crop protection market. The biopesticide market accounts for about 3,000 tonnes of the 0.1 million tonnes worth of annual pesticide trade in India. Moreover, IPM seems to be the only reliable tool to estimate their coverage. "Biopesticides are only used for government programmes. Therefore, the IPM figures reflect the actual usage of biopesticides across the country," says A D Pawar, director of IPM programme of the Union ministry of agriculture. For example, during 1999-2000, around 739 metric tonnes of neem-based biopesticides and at least 135 metric tonnes of Bt-based biopesticides were used under the IPM programme. Going by these figures, it is estimated that the total area under biopesticides is around 0.1 million hectares - a meagre figure considering that the Indian economy is predominantly agrarian. Experts say that this poor showing reflects the lack of awareness among farmers. "Awareness about the advantages of biopesticides is abysmally low as compared to the west," says Jasvir Singh, assistant director, entomology, department of plant protection, quarantine and storage of the Union ministry of agriculture. This affects their demand adversely. Manufacturers claim that the projected demand for biopesticide has failed to become a reality. "Due to lack of demand, dealers of biopesticides are very dissatisfied," says Vivek Singhal, president of New Delhi-based Biotech International Limited, a leading manufacturer of biopesticides. "It is meaningless to keep these products in my shop," says Bhup Singh of Shivam Beej Bhandar, Faridabad, Haryana. "Demand is only for chemical pesticides and not for biopesticides," says S K Bhatia of Zamindar Seed Store, Faridabad. Similar views are echoed by B N Vyas, an official of Godrej Agrovet Limited, Mumbai. "Despite decades of existence, biopesticides are considered as marginal products," he said. This lack of support is proving to be the death knell of this infant industry. 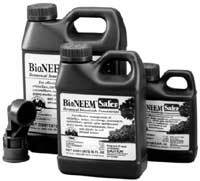 However, the export market is flourishing, particularly for neem-based products. Indian biopesticides are being exported to Iran, Saudi Arabia, Turkey and Italy. Trials and registration are going on in Mexico, Peru, Argentina and Ecuador. "It has a good market abroad. We are exporting around Rs 6-8 crore worth of biopesticides every year and we are expecting an annual growth rate of about five per cent by 2008, provided there is effort to popularise these products," says Saurabh Singhal, managing director of Biotech International Limited. The dismal domestic market of biopesticides indicates that these products still have a long way to go. They are not popular because they have a slow action - they take time to show results. According to Anil Kakkaran official with Mumbai-based Excel Industriesfarmers are used to quick resultsthereforethey do not prefer biopesticides. "It is very difficult to convince farmers about the efficacy of these productssays Seema Wahab, director of biotechnology department, Union ministry of science and technology.The concept of pest managementas compared to the current concept of pest eradicationis yet to be understoodasserts R Manoj, an official with Mumbai-based Ultima Search, a prospective company of the biopesticide sector. The unpopularity of biopesticides also stems from their lack of quality, admit industry leaders.Small companies do not invest money in quality productionsays Saurabh Singhal. Vendors misdirect farmers - biopesticides are marketed as a 'cure' rather than as a 'precautionary measure'. When this reporter enquired about the best biopesticide available in the market from a dealer, the answer was shocking: endosulfan - a known human carcinogenic. Such misformation often misleads farmers. Industry-farmer interface is a must for convincing farmerssays O P Lal, head of entomology department, Indian Council of Agricultural Research (ICAR), New Delhi.There is no dearth of natural plant protection materials. We just need to coax farmersagrees B P S Khambay from the Integrated Approach to Crop Research, a UK-based research organisation. At present, the companies hardly make any effort to get a feedback.Companies need to generate awareness about the benefits of biopesticidessays G P Gupta, principal scientist, division of entomology, ICAR. This interface would also help overcome farmers' fear about the prohibitive cost. Biopesticides can be costly. For example, one litre of Bt-based biopesticide costs as much as Rs 1,000. This is where the government can step in.Biopesticides need to be subsidisedadds Gupta. Incentives in the form of tax rebates will encourage the growth of this sector. No such benefits are given to this sector.Officials equate biopesticides with chemical pesticides. They are not in a position to appreciate the differencesays S Ramarethinam, executive director of T Stanes and Company Limited, a Coimbatore-based company producing agricultural bioproducts.Any amount of repeated explanation falls on deaf ears andthereforewe end up with inadequate financial supporthe adds. Research and development of biopesticides is also very poor.Lack of funds is a major constrain for tapping potential biopesticide sourcessays A K Dikshit, senior scientist at the New Delhi-based Indian Agricultural Research Institute (IARI). A number of agencies are said to be researching about biopesticides. But this is not reflected in the market. Moreover, research is mainly focussed on Bt and neem-based biopesticides.Research should be directed at commercialising new sources of biopesticidessays Ashok Kumar Dhawan, a professor at Punjab Agriculture University, Ludhiana. Experts opine that this trend is a result of the market crisis. Says Lal:Research done in this sector is very limited because of unpopularity of the existing products." He adds that a great deal of research is needed to develop good products. No scientist is working in the real sense for promoting these products. Organisations like ICAR lack the environment for promotion,says A T Dudaniauthor of the first-ever status report of India's pesticide industry. Shortcomings in research is reflected in the few successful 'lab to field transfers' of biopesticides. Focussed screening and development process characterises agrochemical research and development. This ensures successful field transfer. Howeverit is not happening in the case with biopesticides. "The products do not perform in the fields with the same efficiency as they do in the laboratoriessays P K Ghosh, advisor of department of biotechnology, Union ministry of science and technology. Researchers and government are not to be solely blamed either.Research is in nascent stage as it is very difficult to fight the industrywhich is predominantly chemicalsays Saurabh Singhal. According to experts, the control of oil industry over the renewable energy sector is precedent for what might hold true for the biopesticide industry.Many chemical industry entrepreneurs are on the biopesticide bandwagonsays Vivek Singhal. According to him, chemical industry entrepreneurs are stifling the growth of biopesticides by flooding the market with poor quality or spurious products. Even Govind Kutty Menon, chairperson of All India Biodynamic and Organic Farming Association, voices the same concerns.Chemical pesticide lobby is very strong and they are preventing the promotion of biopesticides to save their interestshe says. The chemical industry, however, vehemently denies these allegations.The chemical industry has no vested interest. We are just exploring ways to become ecofriendlysays Salil Singhal, head of environment committee of Federation of Indian Chambers of Commerce and Industry (FICCI). For such entrepreneurs there seems to be little difference between exploration and exploitation. Ironically, officials are aiding them in their 'endeavours', admits M C Diwakar, joint director of Union ministry's IPM programme.The state governments' machinery of IPM is a puppet in the hands of chemical pesticide companies. They work for protecting the industry not the environmenthe says. This 'protection' starts from product registration.Products can be registered by greasing a lot of palms. It just requires about Rs 30-40 lakhssays D Sengupta, director of the Faridabad-based Institute for Pesticide Formulation Technology (IPFT), which develops new pesticide formulations. Considering the fact that IPFT has the final say about product quality before registration is granted, Sengupta's confession just highlights the plight of biopesticides. Even for initial testing of the biopesticide products, our country lacks adequate laboratories, Diwakar admits. The registration blues do not end there. According to Jasvir Singh, anybody seeking registration of biopesticides is apparently given preference even if their products are not supported by sufficient studies on toxicity levels. But Wahab is not impressed who finds procedures very cumbersome.The recent inclusion of biopesticides in the Insecticide Act is the biggest setback for their commercialisationshe says. Many experts feel that Wahab's demand is not justified considering the fact that India's registration procedure for biopesticides is said to be too lax, when compared to countries like the US. Problems pertaining to registration is just the tip of the iceberg. Sengupta admits that IPFT is not equipped for providing technical know-how about biopesticides.We can furnish you with details about technology related to rhizobium-based biofertilisers. But for biopesticides we have to contact other sources." Even the government machinery seems geared up to prevent the promotion of biopesticides. "Biopesticide technology is very costly and there is no guarantee of the market. Thereforefirst go for a market survey and if you can invest Rs 1 crore we will provide you with the detailssaid Sengupta when this reporter posed as an entrepreneur. It is clear that the promise of biological control discovered earlier in this century is still to be realised. However, officials like Diwakar are optimistic.Biopesticides are not being promoted and used due to lack of will and dedication. We can reach zero chemical pesticide level in just 10 years.Plant protection is not a problem if biopesticides are usedclaims Diwakar. But, at present, everybody seems to be confused as to how to make this dream come true. Industry, which is driven by profits, will never take initiatives to promote these products. High cost combined with slow effectiveness are reasons for farmers persistently shying away from using biopesticides. In this double whammy, it is the government that has to act as a bridge, experts opine. Government must provide loans to biopesticide manufactures at lower rates of around 7-8 per centsuggests Ritu Kholsa, a New Delhi-based entrepreneur. The government must subsidise these products in order to cover the cost both for manufactures as well as consumers.Moreoverrules and regulations should be made stringent. There is a need to review the policy of plant protectionsays Diwakar. The industry has to change the nature of its business and start interacting with farmers. The farmers too have to give these products a chance to prove their worth. The future of these products would depend on such collective efforts. The initiative has to be taken by all the sectorssays Jasvir Singh. Menon also supports these views and says:It will take time but surely people are going to realise that these products are safe to use." As of nowit seems that time is running out for these ecofriendly products. And that too at a fast pace.